Lightning is a massive electrostatic discharge caused by unbalanced electric charge in the atmosphere, either inside clouds, cloud to cloud or cloud to ground, accompanied by the loud sound of thunder. A typical cloud to ground lightning strike can be over 5 km (3 mi) long.A typical thunderstorm may have three or more strikes per minute at its peak.Lightning is usually produced by cumulonimbus clouds up to 15 km high (10 mi) high, based 5-6 km (3-4 mi) above the ground. 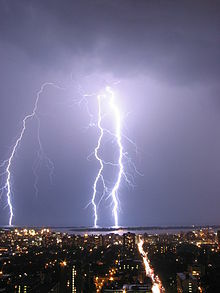 Lightning is caused by the circulation of warm moisture-filled air through electric fields.Ice or water particles then accumulate charge as in a Van de Graaf generator.Lightning may occur during snow storms (thundersnow), volcanic eruptions, dust storms, forest fires or tornadoes.Hurricanes typically generate some lightning, mainly in the rainbands as much as 160 km (100 mi) from the center. When the local electric field exceeds the dielectric strength of damp air (about 3 million Volts/m), electrical discharge results, often followed by more discharges along the same path. Mechanisms that cause lightning are still a matter of scientific investigation.Fear of lightning is called astraphobia. The study or science of lightning is called fulminology. Even assuming an electric field has been established, the mechanism by which the lightning discharge begins is not well known. Electric field measurements in thunderclouds are typically not large enough to directly initiate a discharge.Many hypotheses have been proposed, ranging from including runaway breakdown to locally enhanced electric fields near elongated water droplets or ice crystals.Percolation theory, especially for the case of biased percolation,describe random connectivity phenomena, which produce an evolution of connected structures similar to that of lightning strikes. When the electric field becomes strong enough, an electrical discharge (the bolt of lightning) occurs within clouds or between clouds and the ground. During the strike, successive portions of air become a conductive discharge channel as the electrons and positive ions of air molecules are pulled away from each other and forced to flow in opposite directions. The electrical discharge rapidly superheats the discharge channel, causing the air to expand rapidly and produce a shock wave heard as thunder. The rolling and gradually dissipating rumble of thunder is caused by the time delay of sound coming from different portions of a long stroke. 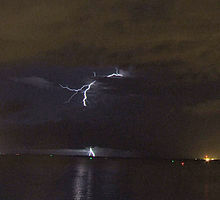 High speed videos (examined frame-by-frame) show that most lightning strikes are made up of multiple individual strokes. A typical strike is made of 3 or 4 strokes, though there may be more.Each re-strike is separated by a relatively large amount of time, typically 40 to 50 milliseconds. Re-strikes can cause a noticeable "strobe light" effect.Each successive stroke is preceded by intermediate dart leader strokes akin to, but weaker than, the initial stepped leader. The stroke usually re-uses the discharge channel taken by the previous stroke.The variations in successive discharges are the result of smaller regions of charge within the cloud being depleted by successive strokes. The sound of thunder from a lightning strike is prolonged by successive strokes. Some lightning strikes exhibit particular characteristics; scientists and the general public have given names to these various types of lightning. The lightning that is most-commonly observed is streak lightning. This is nothing more than the return stroke, the visible part of the lightning stroke. The majority of strokes occur inside a cloud so we do not see most of the individual return strokes during a thunderstorm. thunderstorms and coincides with intensification of thunderstorm updrafts. A similar cloud-to-cloud strike consisting of a brief flash over a small area, appearing like a blip, also occurs in a similar area of rotating updrafts. Ground to cloud lightning is an artificially initiated, or triggered, category of ground flashes. Triggered lightning goes from tall structures on the ground, such as towers on mountains, to clouds. passes over the observer or begins to decay. The most vivid crawler behavior occurs in well developed thunderstorms that feature extensive rear anvil shearing. Sheet lightning is an informal name for cloud-to-cloud lightning that exhibits a diffuse brightening of the surface of a cloud, caused by the actual discharge path being hidden or too far away. The lightning itself cannot be seen by the spectator, so it appears as only a flash, or a sheet of light. The lightning may be too far away to discern individual flashes. Lightning is the world's most underrated weather hazard. It's also the most unpredictable. When it comes to lethal weather, lightning is hard to beat. On average only floods kill more people than lightning. In the United States (and most other places), lightning routinely kills more people every year than tornadoes or hurricanes. Other weather hazards, such as hailstorms and windstorms, aren't even in the running. It's hard to know just when and where it is likely to strike—or how it will behave when it does. Lightning is so dangerous is because of the destructive power it carries. The average lightning bolt carries about 30,000 amps of charge, has 100 million volts of electric potential, and is hot, hot, hot at about 50,000 degrees Fahrenheit. Lightning makes every thunderstorm a potential killer, whether the storm produces one lightning bolt or 10,000. Lightning has been seen during volcanic eruptions and extremely intense forest fires. It has also occurred during hurricanes and heavy snowstorms. Lightning has even been seen during surface nuclear detonations.